"Out to a kind of gravel pit in the bush, where Larry makes 'An abridgement of an abutment to on near or about the Arctic Circle.' Using whatever is at hand, in this case a cigarette package, he leans it against a broken pile of dirt. The piece is donated to the Edmonton Art Gallery, received by Bill Kirby, and will be registered as such by a lawyer." 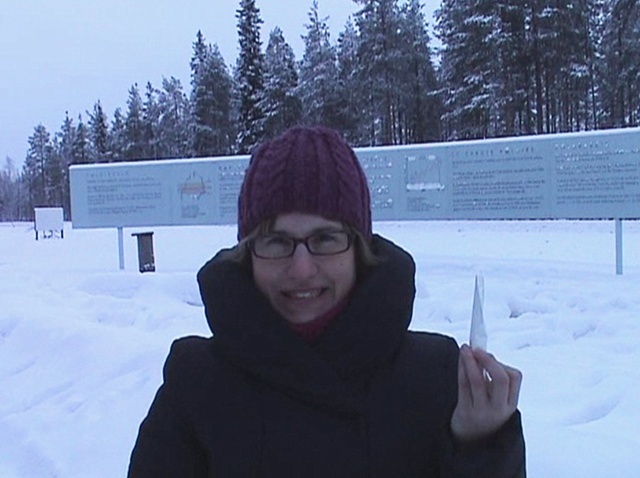 In our re-inactment we used a tampon - whatever was at hand - and performed the piece in a snowy parking lot at the latitude of the Swedish Polar Circle, just south of Jokkmokk.